Languages are constantly shaped by the life trajectories of their speakers. The original base, already subjected to linguistic changes, is further altered by extralinguistic factors, such as sociocultural changes, technological innovations, and encounters with other speech communities. In the African context, the effects of contact with Europeans and Arabs are well known and well documented. But contact is an intrinsic part of history. Events of initial colonization, meaning migrations into unoccupied or sparsely occupied lands, by definition has been limited in number. In most cases, migrations or trade routes lead to contact situations, each translated differently in language. Linguistic contact thus also played a role some centuries and even millennia ago. The study of loanwords, and of language contact more generally, is highly informative of the history of the respective speakers. A second well-studied case is the East-African coast, where the principle language, Swahili, is emblematic of cultural contact. Aside from the fact that East Africa hosts speech communities from three major language families (Nilo-Saharan, Afroasiatic, and Niger-Congo, more specifically, the respective subgroups Nilotic, Cushitic, and Bantu) and some language isolates (Hadza, Sandawe), the coasts have been settings of contacts with many non-African peoples, as well. Written documents from Greek and possibly Roman authors describe East-African coasts from the 1st century ad onward, but Egyptian and Persian traders visited the region long before that time.6 Ever since Swahili culture developed on the East-African coasts during the first millennium ad, it has been influenced by “oriental” elements through contacts with Persian, Iranian, and Indian peoples.7 Most famous, however, are the contacts with Arabic-speaking peoples, who established settlements along the Swahili Coast from the 10th century ad onward. When the Portuguese first arrived at the Swahili Coast in 1498, they encountered a multicultural environment that included people of local African descent and people with “oriental” origins. Portuguese, and during colonialism also British, features were then brought into the mix. Swahili contains traces of all these contacts—mostly loanwords, but also structural elements. It is the Arabic component, however, that receives most attention, which has led to assumptions that the Swahili language resulted from contacts with Arabs. The existence of Swahili literature in Arabic script surely reinforces that idea. The claim, however, is unjustified. Swahili is clearly an African language, a member of the Sabaki subgroup of East Bantu. The influence of the Arabic language is mostly seen in loanwords, which can mainly be categorized into the semantic fields of “jurisprudence, trade, religion, nonindigenous flora, and maritime affairs.”8 These semantic fields correspond to domains in which the Arabs did indeed introduce knowledge into the region—notably: Islam; foods like adesi “lentils” and kashata “cakes, biscuits”; and, at the seaside, the sight of dhows offshore. Applying the principles of comparative linguistics, Nurse and Spear concluded that these loanwords were not affected by specific sound changes and therefore must postdate ad 1500. The absence of large numbers of these loanwords in the non-Zanzibari dialects confirms the late date of their borrowing. The aforementioned Swahili literature also dates to the last few centuries. Still, Arabic influence has a longer history, as is exemplified by vocabulary cited in 12th-century travel accounts and the reconstruction of Arab loans into Proto-Swahili, for instance, ngamia “camel.” The linguistic evidence merely indicates that the contacts in the earlier periods were not as intense as was previously thought. Another case in which loanwords are used to trace the introduction of an important starch food in Central Africa concerns plantains. An osculant series of words, meaning words that are similar in form and meaning, can be reconstructed for Bantu languages with the semantic value “plantain”: *-gòndò ~ *-gòndè ~ *-gò, or the same but with initial consonant *k.12 The series led Malcolm Guthrie to the conclusion that plantains were known to the first Bantu speakers. Jan Vansina, on the other hand, stresses the impossibility of reconstructing one form into Proto-West-Bantu, let alone Proto-Bantu, and suggests an early loanword scenario.13 Plantains would have been introduced from the Upper Nile and further distributed to the west. Vansina’s interpretation is based on archaeobotanical evidence. Other archaeobotanists disagree and propose that they were introduced at the West-Central African coasts.14 The loanword evidence on the trajectories of plantain introduction, however, remains inconclusive. Borrowing, of course, is not the only outcome of contact between speech communities. In Central Africa, early Bantuphone communities came into contact with hunter-gatherers. Central African hunter-gatherers speak languages that are closely related to the languages of their neighbors and thus belong to three different language groups: Bantu and Ubangi (both Niger-Congo) and Central Sudanic (Nilo-Saharan). The degree of affiliation with neighboring languages varies between dialectal differences, on the one hand, and the absence of mutual intelligibility, on the other, as is the case for Aka, Baka, and Asua. Scholars have previously attempted to retrace the original “Pygmy language,” but genetic evidence demonstrates that the differentiation of these hunter-gatherer communities from other populations occurred too far back in time, some 60,000 to 90,000 BP, making the hypothesis of common language inheritance highly unlikely.15 Still, some hunter-gatherer communities may have spoken the same language in a more recent past, as is evidenced by a large set of common vocabulary between Aka and Baka, who currently speak languages belonging to different language groups—Bantu and Ubangi, respectively. Central African hunter-gatherers live in a system of economic exchange with neighboring farmers. Their need for communication explains why language shifts occurred in the past. In some cases, the language of Central African hunter-gatherers does not correspond to that of their neighbors but to people living farther afield, which is suggestive of past migrations. Ehret compared languages to archives, each containing “many thousands of individual artifacts of the past.”16 Following Ferdinand de Saussure, the link between a given word and its referent—that is, the concept it refers to in the real world—is arbitrary. The phonological shape of a word in a given language cannot be predicted. A tree, for instance, has no intrinsic quality that would determine its name.17 Therefore, a tree can be called ǹti in Kikongo and arbre in French. There is no evident link, either, between the semantic value of a word and its referent. The Kikongo word, for example, can be applied to any long wooden object—not just to a tree but also a branch, a stick, or a pole, and so on. The meaning of the French word, in contrast, is limited to a particular type of flora. The lexicon of a language thus offers a specific impression of reality. Given the arbitrary relations between phonological shape, semantic value, and referent, a word with a similar form, meaning, and referent that is shared by two or more languages is the result of shared history. If the word can be reconstructed in the relevant proto-language, it is evidence of shared inheritance. If, however, the word appears to have a longer history in one language, it is likely to have been borrowed into the other. Historians can use this information to study the past. It must be observed, however, that “linguistic artifacts” are only a reflection of reality and therefore always constitute indirect evidence. The loanword evidence here indicates a layered history of newly adopted subsistence strategies: from a hunter-gatherer economy with expertise in elephant hunting to the exploitation of aquatic resources, cattle-keeping, and, ultimately, agriculture. The semantic fields of adopted loanwords are indicative of the nature of the contacts that occurred between the concerned speech communities. The loanwords from Kwangali are mainly linked to male activities, especially cattle-keeping; this, according to Möhlig, is linguistic proof of intermarriage between Rumanyo-speaking women and Kwangali men.22 A more frequent type of contact leading to the adoption of loanwords is trade, which may vary between occasional contacts, at one end of the spectrum, and a system of economic symbiosis, at the other end of the spectrum. Other contact situations include those of religious and political dominance. Arabic loans in Swahili may be cited here; but think also of the many loans of European origins concerning political structures and Christianity. The identification of loanwords depends on the quality of the linguistic data, the available knowledge on sound correspondences, and insights into language classification. If there are issues with any one of those three components, it complicates the comparative work. Concerning the data, the collected lexicon is ideally notated with all phonological and tonal information, and with a detailed description of its semantic value and all possible referents. The best way to retrieve such data is through fieldwork or by the use of detailed dictionaries. However, the study of early history requires comparing vocabulary in a large set of languages, rendering fieldwork for each language impossible. The solution is to work with dictionaries, glossaries, word lists, and other documents that contain lexical data. Tone and semantic detail—valuable information that may be necessary to determine a word’s origins—are often lacking in such sources. A second issue concerns regular sound correspondences established by previous authors. Guthrie’s Comparative Bantu, for instance, is regularly consulted by historians and historical linguists. Still, Guthrie doesn’t include all Bantu languages. Moreover, he doesn’t list all sound correspondences for the languages that are included. This can be overcome by following the principles of comparative linguistics and establishing sound correspondences by looking at a wider sample of vocabulary. Of course, this adds extra steps to the research process and required the availability of sufficient comparative data for the languages concerned. Finally, the interpretation of the results is shaped by the available insights on the historical relations between the languages under study. How to classify language groups like Bantu is the subject of an ongoing debate. As a consequence, integrating the results in one language tree or the other may lead to different historical narratives. Moreover, classifications of smaller subgroups may not even be available. Some historical works show the investment of the respective scholars in the linguistic history of the communities under study.26 However, time constraints force most studies to rely on the available literature on sound shifts and classifications, which means that they are subject to the aforementioned drawbacks. The study of loanwords also suffers from some limitations linked to the nature of linguistic change and contact. When the donor language and the recipient language belong to different language families, as in the Swahili examples, identifying loanwords is a rather straightforward matter considering the very different phoneme and morpheme inventories of each language family. When borrowing occurs between languages of the same language family, or even the same language subgroup, it is harder to distinguish between cognates and loans. Möhlig offers the example of Rumanyo vocabulary displaying the sound correspondence Proto-Bantu *c > h, whereas many other terms are the outcome of *c > sh.27 Words such as mahângu “millet,” hûpa “calabash,” and hâmbo “cattle-pen” can be linked to reconstructions for earlier stages in Bantu history (*-cángú, *N-cúpà, and *N-cámbò, respectively) and, at first glance, look to be inherited into Rumanyo.28 Given that the sound change *c > h is not regular in Rumanyo and seems reserved mostly to vocabulary in the lexical fields of cattle-keeping and agriculture, Möhlig concludes that the relevant words are loans from another Bantu language, namely, Kwangali. Still, sound correspondences do not always provide the answer. In a fairly homogenous language group such as Bantu, some sound shifts are identical in many of the individual languages. Sometimes, there is no sound shift at all. Proto-Bantu nasals, for instance, have not changed much in most of the Bantu languages and, except for the 7- to 5-vowel merger, the same holds true for vowels. The word unga “flour” is identical in many East-Bantu languages or is semi-identical when different forms of the noun prefix are taken into account—vunga in Tikuu and ubunga in Bemba, for example.29 Considering the distribution of the noun, a reconstruction could be proposed for Proto–East Bantu with the form *NP14-ʊ̀ngà. However, the distribution also largely corresponds to the region where Swahili is used as a lingua franca, and several dictionary authors consider the word to be a loan from Swahili. Tonal information could be helpful here, because loans from the nontonal language Swahili regularly appear with a high-low tone pattern in the recipient tonal language. Unfortunately, dictionaries too often lack tone notations. In short, there is no conclusive linguistic evidence in this case to determine whether unga is a recent loan or an inherited term. An important asset of loanwords is the possibility to trace the origins of a word and, consequently, its referent. The above-mentioned examples illustrate the adoption of tools, crops, techniques, and so on, by one or several speech communities from identifiable source communities. However, loanwords can often be distinguished from inherited vocabulary without a clear indication of a donor language, and hence a community. For instance, Northern Kongo kipáki “wooden board on which cassava is kneaded” and kípúúti “cassava dough” display the plosive /p/ instead of the regular, expected /h/ or /v/. The loans kipáki and kípúúti are clearly related to the adoption of cassava preparations, but for now, no origins can be formulated for the two nouns. Loanwords constitute but one outcome of contact between speech communities. On the lexical level, contact may also result in loan translations or calques. A loan translation is a literal translation of a foreign concept, for instance, Swahili poa “be(come) cool” from the English cool, or maneno ya kuazima “borrowed words” from English loanwords. Other lexical outcomes are loan blends and correspondence mimicry. Loan blends are words that combine borrowed and inherited elements, for instance, kijipicha “thumbnail,” which combines the Swahili diminutive ki-ji- with the English borrowing picha “picture.” Correspondence mimicry refers to the phonological adaptation of loanwords based on the sound correspondences between the languages concerned as perceived by the speakers, for instance, the insertion of /l/ in Nyakyusa itala “lamp, torch” from Swahili taa after the regularly corresponding Nyakyusa -zala and Swahili zaa “to bear a child.”32 Structural borrowing involves the borrowing of phonological and grammatical features. Lodhi, for instance, observes that the Arabic influence in Swahili includes structural elements, as in the use of conjunctions and prepositions.33 Long-term contact between languages can also lead to convergence. A linguistic area, or “Sprachbund,” is one in which languages belonging to different language groups or families display common features as a result of convergence. In East Africa, the Tanzanian Rift Valley forms a linguistic area, where Sandawe, Hadza, and Southern Cushitic, Nilotic and Bantu languages share linguistic features.34 More dramatic consequences of language contact include language shift, as in the case of Central African hunter-gatherer languages, and the creation of new languages—namely, pidgins and creoles. (1.) This article is not an exhaustive list of historical works using loanword evidence, or of the literature on each of the topics covered, but it includes some fine examples of historical conclusions based on the linguistic evidence of language contact, some of which are discussed in detail. The examples stem mostly, though not exclusively, from the field of expertise of the author—namely, the food history of Bantu-speaking communities, a lexical domain in which borrowing has occurred extensively throughout history. (2.) Birgit Ricquier, “Porridge Deconstructed: A Comparative Linguistic Approach to the History of Staple Starch Food Preparations in Bantuphone Africa” (PhD diss., Université Libre de Bruxelles, 2013); and Birgit Ricquier, “A Foodie’s Guide to Kongo Language History: Early Events, North versus South, and the Innovative West,” Africana Linguistica 22 (2016): 107–146. (4.) These results were forwarded by Birgit Ricquier and Odette Ambouroue, “Congo River Crossroads Cuisine: A Blend of Western and Eastern Words” (5th International Conference on Bantu Languages “Bantu 5,” Paris, 2013). More names and the dispersal routes of American crops can be found in Helma Pasch, Linguistische Aspekte der Verbreitung lateinamerikanischer Nutzpflanzen in Afrika (Cologne: Universität zu Köln, 1980). (5.) See Judith A. Carney and Richard Nicholas Rosomoff, In the Shadow of Slavery: Africa’s Botanical Legacy in the Atlantic World (Berkeley: University of California Press, 2009); and Birgit Ricquier, “Kongo Cuisine and the Middle Passage in Terms of Peanuts,” in Kongo across the Waters, ed. Susan Cooksey, Robin Poynor, and Hein Vanhee (Gainesville: University Press of Florida, 2013), 258–263. (6.) Abdulaziz Y. Lodhi, Oriental Influences in Swahili: A Study in Language and Culture Contacts (Gothenburg: Acta Universitas Gothoburgensis, 2000), 50. See also Abdul Sheriff, “The Swahili in the African and Indian Ocean Worlds to c. 1500,” The Oxford Research Encyclopedia of African History (December 2017). (7.) Adria LaViolette, “Swahili Cosmopolitanism in Africa and the Indian Ocean World, A.D. 600–1500,” Archaeologies: Journal of the World Archaeological Congress 4, no. 1 (2008): 24–49; Matthew Pawlowicz, “Modelling the Swahili Past: The Archaeology of Mikindani in Southern Coastal Tanzania,” Azania: Archaeological Research in Africa 47, no. 4 (2012): 489; and Derek Nurse and Thomas Spear, The Swahili: Reconstructing the History and Language of an African Society, 800–1500 (Philadelphia: University of Pennsylvania Press, 1985), 31. (8.) Nurse and Spear, Swahili, 15. (9.) Christopher Ehret, “Cattle-Keeping and Milking in Eastern and Southeastern African History: The Linguistic Evidence,” African History 8 (1967): 1–17; Ehret, “Agricultural History in Central and Southern Africa, ca. 1000 B.C. to A.D. 500,” Transafrican Journal of History 4, no. 1–2 (1974): 1–25; Ehret, An African Classical Age: Eastern and Southern Africa in World History 1000 B.C. to A.D.400 (Charlottesville: University of Virginia Press, 1998); David L. Schoenbrun, “We Are What We Eat: Ancient Agriculture between the Great Lakes,” Journal of African History 34 (1993): 1–31; and Schoenbrun, A Green Place, A Good Place: Agrarian Change, Gender and Social Identity in the Great Lakes Region to the 15th Century (Portsmouth, NH: Heinemann, 1998). (10.) 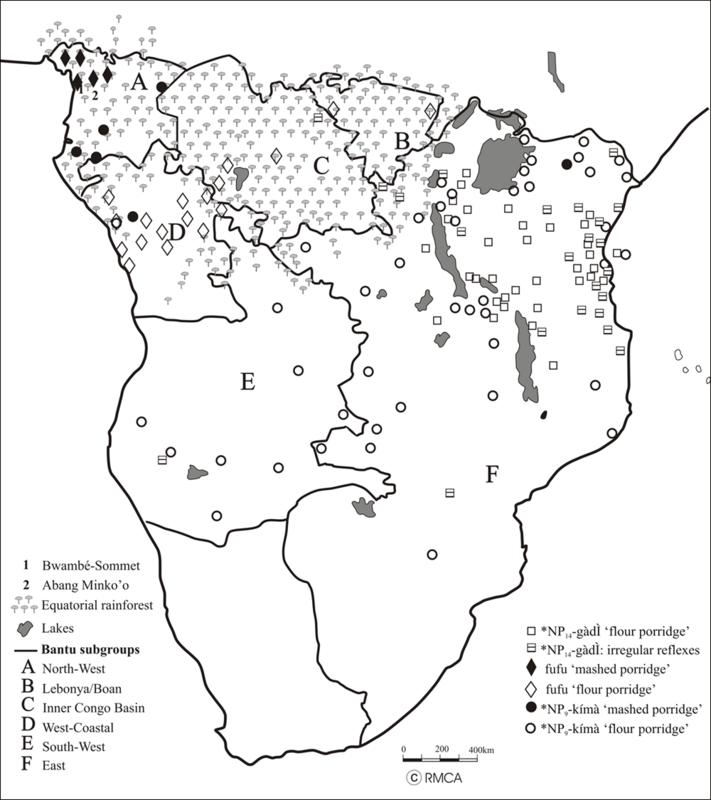 Koen Bostoen, “Pearl Millet in Early Bantu Speech Communities in Central Africa: A Reconsideration of the Lexical Evidence,” Afrika und Übersee 89 (2006–2007): 183–213. (11.) Birgit Ricquier and Koen Bostoen, “Stirring Up the Porridge: How Early Bantu Speakers Prepared Their Cereals,” in Windows on the African Past: Current Approaches to African Archaeobotany, ed. A. G. Fahmy, S. Kahlheber, and A. C. D’Andrea, 209–224 Proceedings of the 6th International Workshop on African Archaeobotany, Cairo (Frankfurt: Africa Magna Verlag, 2011); and Birgit Ricquier, “The History of Porridge in Bantuphone Africa, with Words as Main Ingredients,” Afriques 5 (2014). (12.) Gérard Philippson and Serge Bahuchet, “Cultivated Crops and Bantu Migrations in Central and Eastern Africa: A Linguistic Approach,” Azania (The Growth of Farming Communities in Africa from the Equator Southwards) 29–30 (1994–1995): 103–120; Edmond De Langhe, Rony L. Swennen, and D. Vuylsteke, “Plantain in the Early Bant World,” Azania: The Growth of Farming Communities in Africa from the Equator Southwards 29–30 (1994–1995): 147–160. The series is reconstructed with initial consonant *k in Malcolm Guthrie, Comparative Bantu: An Introduction to the Comparative Linguistics and Prehistory of the Bantu Languages, 4 vols. (Farnborough, UK: Gregg Press, 1967–1971); Jan Vansina, Paths in the Rainforest: Toward a History of Political Tradition in Equatorial Africa (Madison: University of Wisconsin Press, 1990). (14.) De Langhe, Swennen, and Vuylsteke, “Plantain”; and Christophe M. Mbida, Hugues Doutrelepont, Luc Vrydaghs, Rony L. Swennen, et al., “First Archaeological Evidence of Banana Cultivation in Central Africa during the Third Millennium before Present,” Vegetation History and Archaeobotany 10, no. 1 (2001): 1–6. (15.) Serge Bahuchet, “Changing Language, Remaining Pygmy,” Human Biology 84, no. 1 (2012): art. 9. (16.) Christopher Ehret, “Writing African History from Linguistic Evidence,” in Writing African History, ed. J. E. Philips, 86 (Rochester, NY: University of Rochester Press, 2005). (17.) Exceptions are, of course, onomatopoeias, even if these are also language-specific and susceptible to inheritance and borrowing. Consider, for instance, the word for “sheep” dimeeme, which can be reconstructed into Proto-West-Bantu. (18.) Lodhi, Oriental Influences, 129. Of course, English doctor is itself a loan from Latin. (19.) Words with an asterisk * are reconstructions in a proto-language, for instance Proto-Bantu, Proto-East Bantu, and so on. Where possible, not just the noun stem but also the nominal prefix is reconstructed. Here, “NP9-” refers to the nominal prefix of noun class 9. (20.) See Ricquier, “History of Porridge,” Map 1. (21.) Sample from Wilhelm J. G. Möhlig, “Linguistic Evidence of Cultural Change: The Case of the Rumanyo Speaking People in Northern Namibia,” Sprache und Geschichte in Afrika 18 (2007): 135, 144, 148, 150. (22.) Möhlig, “Linguistic Evidence,” 147. (23.) Nurse and Spear, Swahili, 15. (24.) Nurse and Hinnebusch link sound shifts to subgroups and seek correlates for the concerned ancestor communities in archaeology. As such, they obtain dates for the occurrence of the mentioned sound shifts. Derek Nurse and Thomas J. Hinnebusch, Swahili and Sabaki: A Linguistic History, ed. Thomas J. Hinnebusch, with a special addendum by Gérard Philippson (Berkeley: University of California Press, 1993), 648. See also The White Fathers, Bemba-English Dictionary (London: Longmans, Green, 1954). (25.) Ehret, “Cattle-Keeping”; Ehret, African Classical; Schoenbrun, “We Are What We Eat”; and Schoenbrun, Green Place. (26.) For instance, Schoenbrun, Green Place; linguistic material and conclusions in David L. Schoenbrun, “Great Lakes Bantu: Classification and Settlement Chronology,” Sprache und Geschichte in Afrika 15 (1994): 91–152; and Schoenbrun, The Historical Reconstruction of Great Lakes Bantu Cultural Vocabulary: Etymologies and Distributions (Cologne: Rüdiger Köppe Verlag, 1997). Another example is Kathryn de Luna, Collecting Food, Cultivating People: Subsistence and Society in Central Africa (New Haven, CT: Yale University Press, 2016). (27.) Möhlig, “Linguistic Evidence,” 147–148. (28.) This is Möhlig’s notation. In the database Bantu Lexical Reconstructions 3, the vowels receive a different notation—namely, *-cángʊ́, *N-cʊ́pà, and *N-cámbò. (29.) Nurse and Hinnebusch, Swahili and Sabaki, 54. (30.) Lodhi, Oriental Influences, 30. (31.) Möhlig, “Linguistic Evidence,” 144. (32.) Examples from Lodhi, Oriental Influences; and Gerrit J. Dimmendaal, Historical Linguistics and the Comparative Study of African Languages (Amsterdam: John Benjamins, 2011). (33.) Lodhi, Oriental Influences, 99–115. (34.) Details in Roland Kiessling, Maarten Mous, and Derek Nurse, “The Tanzanian Rift Valley Area,” in A Linguistic Geography of Africa, ed. Bernd Heine and Derek Nurse, 186–227 (Cambridge, UK: Cambridge University Press, 2008). (36.) Mary Allen McMaster, “Patterns of Interaction: A Comparative Ethnolinguistic Perspective on the Uele Region of Zaïre ca. 500 B.C. to 1900 A.D.” (PhD diss., University of California, 1988); Schoenbrun, “We Are What We Eat”; Schoenbrun, Historical Reconstruction; and Schoenbrun, Green Place. (37.) Edda L. Fields-Black, Deep Roots: Rice Farmers in West Africa and the African Diaspora (Bloomington: Indiana University Press, 2008). (38.) Derek Nurse, ed., Historical Language Contact in Africa, Sprache und Geschichte in Afrika 16/17 (Cologne: Rüdiger Köppe Verlag, 2001); Wilhelm J. G. Möhlig, ed. Cultural Change in the Prehistory of Arid Africa: Perspectives of Archaeology and Linguistics, Sprache und Geschichte in Afrika 18 (Cologne: Rüdiger Köppe Verlag, 2007); Wilhelm J. G. Möhlig, Frank Seidel, and Marc Seifert, eds., Language Contact, Language Change and History Based on Language Sources in Africa, Sprache und Geschichte in Afrika 20 (Cologne: Rüdiger Köppe Verlag, 2009); Lodhi, Oriental Influences in Swahili; Derek Nurse, Inheritance, Contact, and Change in Two East African Languages (Cologne: Rüdiger Köppe Verlag, 2000); and Nurse and Hinnebusch, Swahili. (39.) Serge Bahuchet and J. M. C. Thomas, “Linguistique et histoire des Pygmées de l’ouest du bassin congolais,” Sprache und Geschichte in Afrika 7, no. 2 (1986): 73–103; Serge Bahuchet, “History of the Inhabitants of the Central African Rain Forest: Perspectives from Comparative Linguistics,” in Tropical Forests, People, and Food: Biocultural Interactions and Applications to Development, ed. C. M. Hladik, 37–54 (Paris: Unesco/Parthenon, 1993); Bahuchet, “Changing Language”; and Kairn Klieman, “The Pygmies Were Our Compass”: Bantu and Batwa in the History of West Central Africa, Early Times to c. 1900 C.E. (Portsmouth, NH: Heinemann, 2003). (40.) CBOLD, Comparative Bantu OnLine Dictionary, University of California, in Berkeley; and Derek Nurse and Gérard Philippson, Tanzanian Language Survey, 1975. (41.) “African Linguistics: Lexicostatistic study Bantu languages,” Royal Museum for Central Africa,; and Yvonne Bastin, André Coupez, and Michael Mann, Continuity and Divergence in the Bantu Languages: Perspectives from a Lexicostatistic Study (Tervuren, Belgium: Royal Museum for Central Africa, 1999). (42.) Guthrie, Comparative Bantu; Jan Daeleman, “Les réflexes Proto-Bantu en Ntándu (dialecte Kóongo),” in Mélanges de culture et de linguistique africaine, publiés à la mémoire de Leo Stappers, ed. C. E. S. Faïk-Nzuji Madiya, 331–397 (Berlin: Dietrich Reimer Verlag, 1983); Jean-Noël Nguimbi Mabiala, “Phonologie comparative et historique du kongo (groupe H10): Kiyoombi–Civili–Kibeembe–Kihangala–Kisuundi–Cilaadi” (PhD diss., Université Lyon 2, 1999); Nurse and Hinnebusch, Swahili and Sabaki; Balla Masele, “The Linguistic History of SiSuumbwa, KiSukuma and KiNyamweezi in Bantu Zone F” (PhD diss., Memorial University of New Foundland, 2001); Derek Nurse, Classification of the Chaga Dialects: Language and History on Kilimanjaro, the Taita Hills, and the Pare Mountains (Hamburg, Germany: Helmut Buske Verlag, 1979); and Thomas J. Hinnebusch, Derek Nurse, and Martin Mould, Studies in the Classification of Eastern Bantu Languages (Hamburg, Germany: Helmut Buske Verlag, 1981). (43.) Yvonne Bastin, André Coupez, Evariste Mumba, and Thilo Schadeberg, Bantu Lexical Reconstructions 3 (Tervuren, Belgium: Royal Museum for Central Africa, 2002). (44.) Birgit Ricquier, “The ‘Words and Things’ Method,” in Field Manual for African Archaeology, ed. Alexandre Livingstone Smith, Els Cornelissen, Olivier P. Gosselain, and Scott MacEachern, 261–263 (Tervuren, Belgium: Royal Museum for Central Africa, 2017).